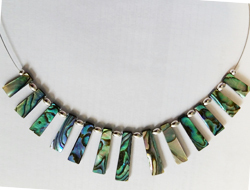 13 pieces of Paua of different sizes which make a pyramid shape, attached to a thread and separated by a bead. Unique to New Zealand, Paua is the name of and edible snail found in the waters around the rocky coastlines of New Zealand. Highly polished it has beautiful iridescence colours of blues, greens and purples and wonderful organic black patterns, caused by proteins between layers of the shells. Each and every shell has different colour tones and patterns making every piece uniquely beautiful.